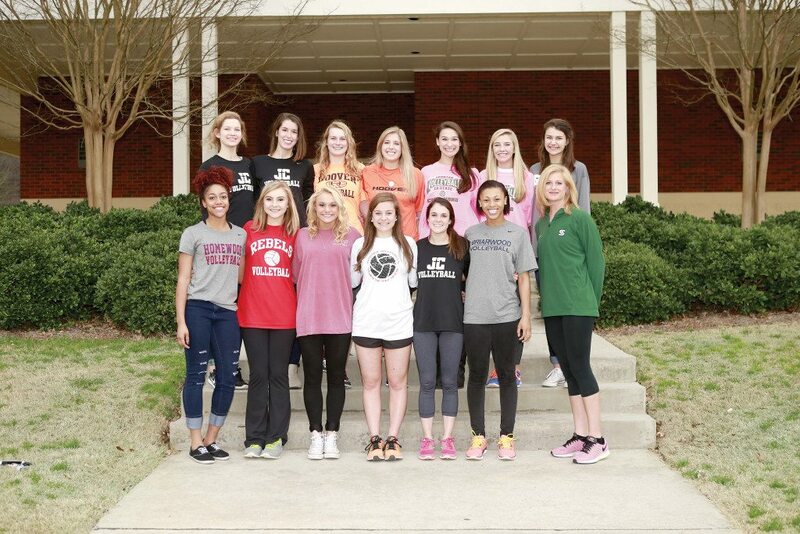 Members of the All-Over The Mountain Volleyball Team include (front, from left): Dejani Hester-Taylor, Homewood; Manon Burris, Vestavia Hills; Cameron Reuschenberg, Oak Mountain; Olivia Portera, Hoover; Anna Runyan, John Carroll Catholic; Taylor Moore, Briarwood; and Coach Haven O’Quinn, Mountain Brook. Back: Kelsi Hobbs, John Carroll Catholic; Mary Catherine Hart, John Carroll Catholic; Ali Lowe, Hoover; Caroline Sanford, Hoover; Sara Carr, Mountain Brook; Payton Selman, Mountain Brook; and Marlee Johnson, Spain Park. Not pictured: Sara Chandler Mitchell, Mountain Brook. Photo by Marvin Gentry. After winning the state Class 7A championship in 2014, it was hard to imagine how the Mountain Brook volleyball team could do just as well or better in 2015. But that’s exactly what the Lady Spartans did. Mountain Brook posted a 57-6 record and defeated powerful McGill-Toolen in the finals in three sets to win a second consecutive title. The Lady Spartans weren’t the only area team that experienced a memorable season. John Carroll’s bid for a second consecutive Class 6A title ended with a close loss to Spanish Fort in the finals. And the Hoover Lady Bucs joined Mountain Brook in the Class 7A Elite Eight. With that kind of success, it’s no surprise that the 2015 All-Over the Mountain volleyball team is loaded with talent. Mountain Brook, John Carroll and Hoover each placed three players on the team, which is chosen by the head coaches of the eight schools that participate in classes 7A and 6A. Sara Carr of Mountain Brook, the 2015 Over The Mountain Player of the Year, and Coach Haven O’Quinn of Mountain Brook, the 2015 Over The Mountain Volleyball Coach of the Year. Photo by Marvin Gentry. named Coach of the Year by her peers. Carr had a tough act to follow after her junior season. Not only was she Player of the Year in 2014, but she was also named to the All-Over the Mountain girls basketball team. Last June, Carr was chosen as the 2014-15 Over the Mountain Girl Athlete of the Year. Carr is joined by teammates Sara Chandler Mitchell and Payton Selman on the All-Over the Mountain team. John Carroll and Hoover also each placed three girls on the team. The Lady Cavs are represented by Kelsi Hobbs, Mary Catherine Hart and Annie Runyan. Caroline Sanford, Olivia Portera and Ali Lowe represent the Lady Bucs. Also qualifying for the team are Taylor Moore, Briarwood; Deja Hester Taylor, Homewood; Cameron Rueschenberg, Oak Mountain; Marlee Johnson, Spain Park; and Manon Burris, Vestavia Hills.